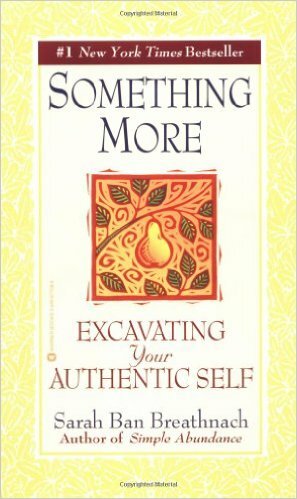 I’ve been reading, yet again, one of my all-time favourite books: Something More; Excavating Your Authentic Self by Sarah Ban Breathnach (author of Simple Abundance; A Daybook of Comfort and Joy). Alas, as is often the way with matters pertaining to the soul, it’s a book I find to be more unsettling than encouraging – but in a good way. Its candour cuts to the core of some pretty deep truths about women’s lives, particularly about the danger of…settling. But when we fall asleep at the wheel of our own lives (and I suspect it happens to most of us at some point) and begin making small but significant decisions on auto-pilot – that serve to keep the peace but aren’t necessarily for our own highest good – we can run into trouble. But many women don’t STOP because a) they lead very busy lives (and likely manage several other people’s busy lives, as well) and; b) to stop means to think and that could lead to reflecting and that could lead to change and that could lead to all sorts of uncomfortable things for all sorts of people. So, on some level, it seems wiser to keep moving – and the status quo intact. Been there, done that, got the (very expensive) t-shirt. So how do we know when we’ve veered off track…away from our soul’s authentic path? By how we feel. If I had read that when I was 17, I would have thought it ridiculous. But now that I’ve experienced life on this planet for almost 50 years, I know that a mere desire to keep things the way they are is NOT going to stop the process of change. Time and time again, I have found this to be true in my own life. This looks like a great read! Thanks for sharing! Great article. I am interested in reading the book too. It’s all interesting at this stage of the game, I agree. I have changed my thinking since I was 17 or 20 for sure. I give my girls different advice then what I got. I also tell them to be independent women before moving on to marriage or a relationship. Not sure how that is turning out though.